If you subscribe to our Constant Contact email news, you are already aware that we brought back our popular SPECIAL OFFER – DESIGN OF THE MONTH. In March we featured ANATOLIA; in April MOROCCO STRIPE, and in May CELTIC KNOT; in June it was GAME BOARD ; in July and August TULIP & TULIP BORDER. 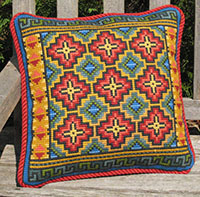 For September, we are offering our PISAC pattern at the 20% off Retail as our current DESIGN OF THE MONTH. On the cross-point online website, you will find a listing of companion pillows that are related in color and pattern. 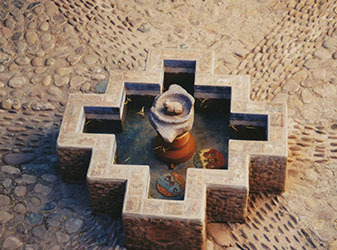 PISAC is available in three sizes and in 7 colorways (from bright to muted), as well as a repeat pattern by the square inch. Eminently suitable for upholstery, it would be stunning on a stool, ottoman or chair seat and back. 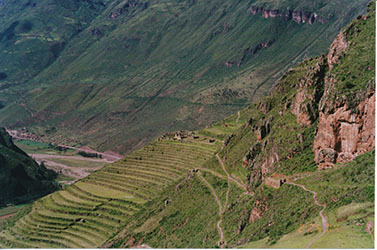 Please place orders directly from the web site pattern page for PISAC. There is also a short video on youtube previously included on our FACEBOOK page. This entry was posted in Autumn/Early Winter, Color Schemes - Winter Reds, cross-point Color Schemes, cross-point kits, Meadow & Field colors for summer stitching, Part I - Cheerful Autumn Colors for stitching, Winter Reds and tagged About cross-point, Autumn Colors, color schemes for stitching, cross stitch kits, cross-point, crosspoint kits, Interior Design, Kilim stitching patterns, needlepoint kits, Peru, Pisac, upholstery designs. Bookmark the permalink.